Yesterday, my husband and I took a walk across the Foresthill Bridge. It’s 730 feet high, the third highest in the US. At least one person commits suicide, by jumping from it, every year. At the midpoint, there were several names and dates scratched in the paint of the handrail. Each one named a person and the date of their death. It was very sobering to stand where they had stood and contemplate what had brought them to that same point on the bridge, with the intention of never walking off of it. Looking over the side was dizzying. They must have been extremely determined, and hopeless, to climb up and step out. There’s a call-box right there, imploring them to not jump, but reach out for help. How many make the call? How many don’t? How many choose neither and return to their life with no one the wiser? They were very sobering, these realities. It was a cloudy day yesterday. Heavy with thoughts and emotions. I thought about all the times I’ve felt everyone would do better without me around. But I could not jump off that bridge, and I won’t. I will continue my search for strategies, methods, meditations, beliefs and actions to help me survive and heal here, on Earth and alive in my world. Death can be very abstract until you see it up close and real. Those names and dates were real. And a caring, grieving family member or friend scratched them in the paint so that the person wouldn’t be forgotten. Nor their pain and desperation. Someone was the last person to speak to them. Someone discovered them, fallen. Someone had to pick up the crumpled, lifeless body. Someone had to find the family and let them know what had happened. And then there are those the person left behind. Those who knew of their pain, and those who didn’t. But they were all left with the loss of that person in their lives, and how they would take that knowledge forward into their own. I hope it made a difference. 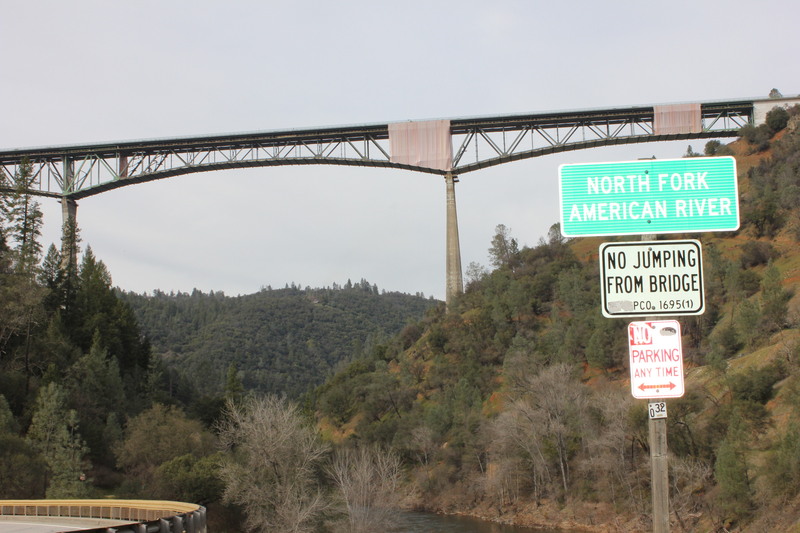 Below the bridge flows the north fork of the American River, flanked by beautiful forests, tumbling to join with the middle fork in an area known as the confluence. It’s an area enjoyed by all kinds of people every day of the year. To see such beauty and energy so close to such sadness and desperation is difficult to comprehend. But in seeing and reflecting, I know which scene I want to reflect my life. 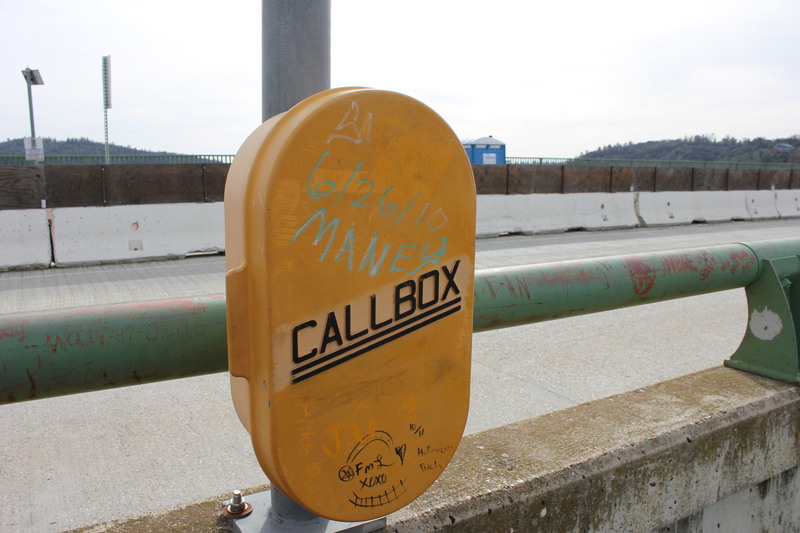 I hope all those who choose to walk the bridge to the middle will stop and use the call-box. My next walk there will be to enjoy the view and beauty, before I continue my walk to the paths below where life is exuberant and ongoing.